Sorry for the "radio silence" this week; our group of priests was moving about quite a bit, ultimately covering about 2200 kilometers/1300 miles, from Antakya (Antioch), in south-central Turkey, near the Syrian border, to Kusadasi/Selcuk area, which is where the (well preserved) ruins of Ephesus are. We're actually back in Rome now; it's about 9 am on Saturday, the Feast of the Chair of Saint Peter; yesterday was a travel day, and we arrived back at the residence between 6:30 and 7 pm. 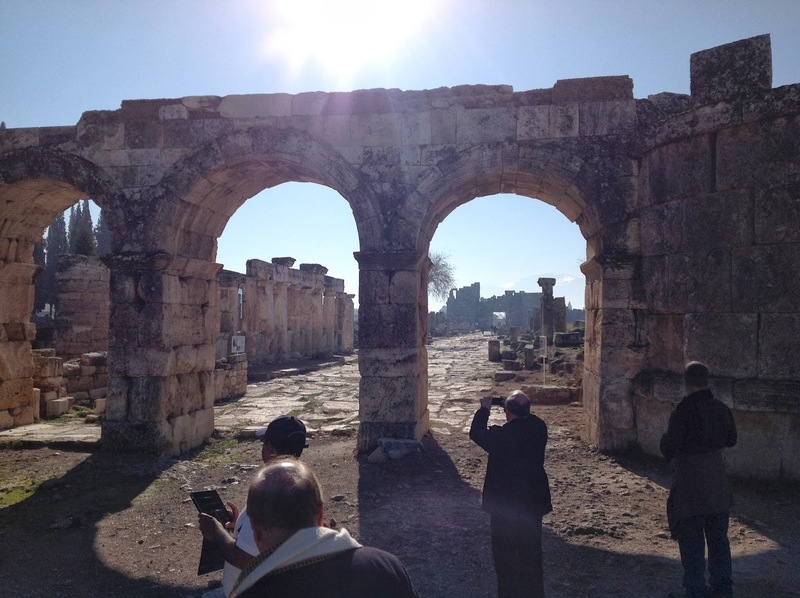 It would have been lovely to have offered Holy Mass in Tarsus, Saint Paul's birthplace, but that's not allowed. The church there is a museum. There are three sisters there; the government graciously allows them to live there, and look after the pilgrims, but that's it. 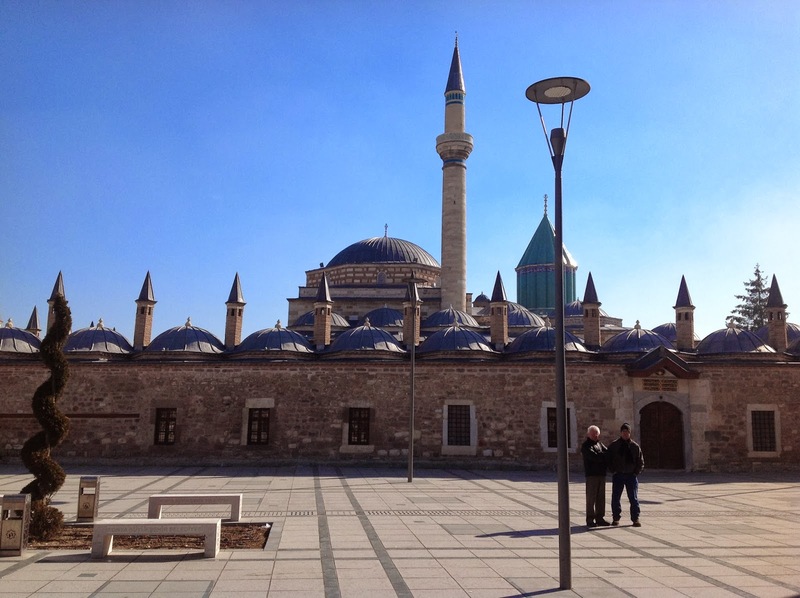 Here we are visiting an historic mosque in Konya (called Iconium in Saint Paul's time), next to a shrine to a revered Sufi philosopher and poet. As you can see, we're removing our shoes before entering. The entryway was curious. Behind the rug is a proper door, but this was open, and they had a wooden stand of some sort that props up the rug as you can see. 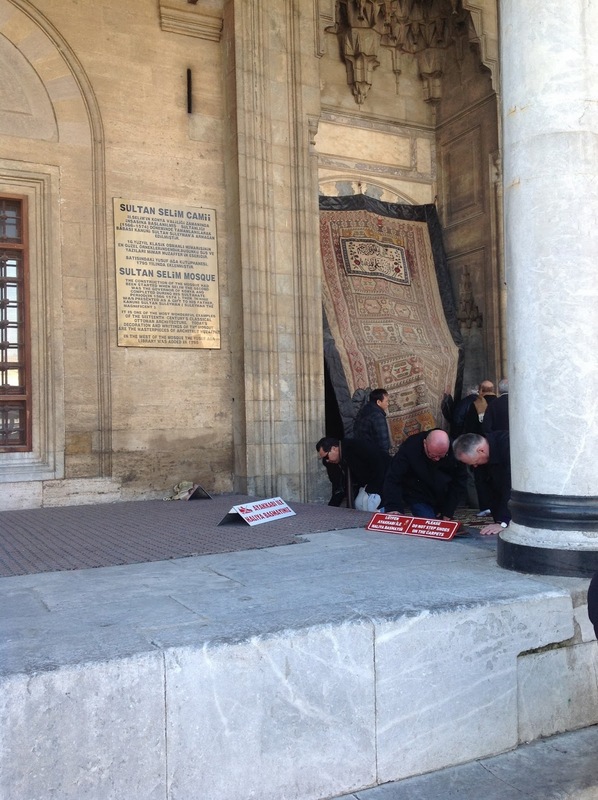 The rug itself was very heavy. 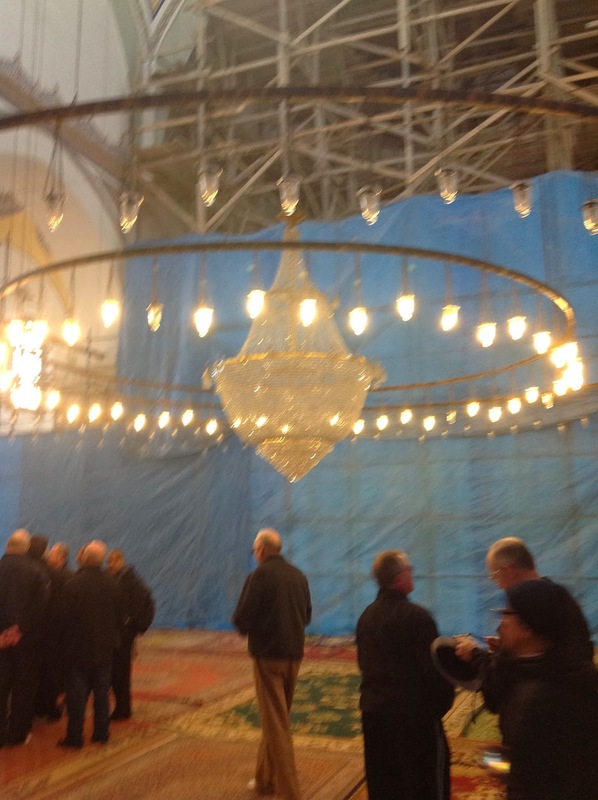 Here's the inside of the mosque. 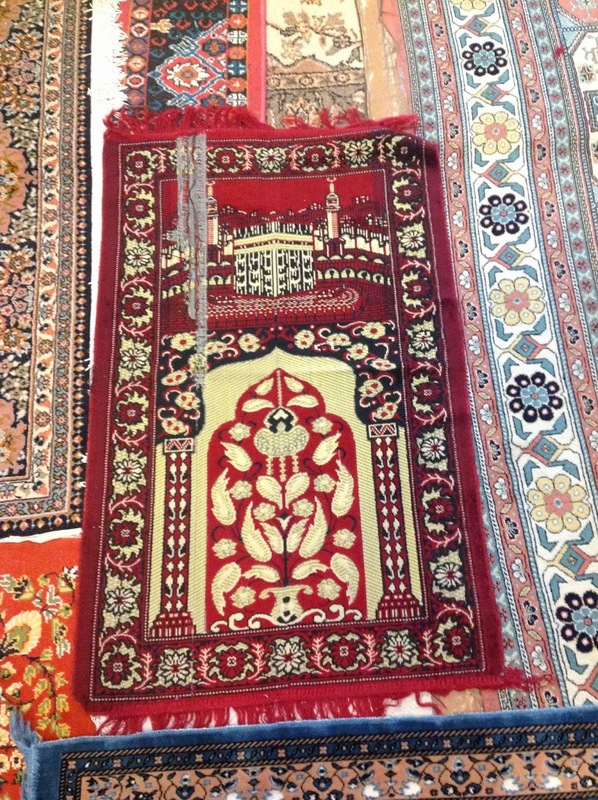 It was not prayer time when we visited, and our guide explained various things. As you can see, the building is having some work done; as a result, he couldn't point out to us the special niche that tells worshippers which way to Mecca. Muslims, when they pray, face Mecca. Here's one of the many rugs that covered the floor. Note the illustration, showing the Ka'aba, in Mecca, the holiest of Muslim shrines. After this, we visited the shrine of Jalāl ad-Dīn Muhammad Balkhī, also known as Rumi. This complex was, at one time, a kind of monastery for the sect commonly known as the Dervishes, or the Whirling Dervishes, for a kind of dance they do; it is actually a kind of prayer. 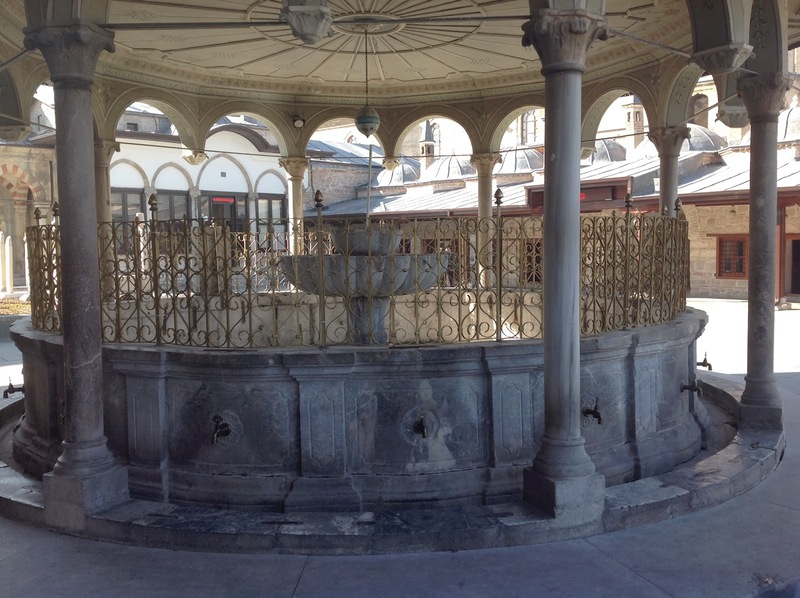 If you think the secular government of Turkey is hard on Christians -- and it is -- consider this; since 1925, this religious group had it's one and only sacred site confiscated by the government (and turned into a museum); and the group itself is outlawed. Oh, they're allowed to perform their ritual...as a tourist attraction only. Imagine being told, "oh, you can have Holy Mass--but only for tourists." Hmm...apparently I didn't snap any other pictures from the complex, other than this. Can you guess what this is? My understanding is that Muslims will wash their feet before prayers; and that's what this is for. No, it's not a baptismal font; but wouldn't it make a splendid one? In the background, you can see two sides of the courtyard; the door on the left leads to the common refectory/dining room; the doors toward the right are to the various cells/rooms used by the members of the order. Because we were trying to connect with the world Saint Paul knew, we visited lots of ruins. LOTS of ruins. 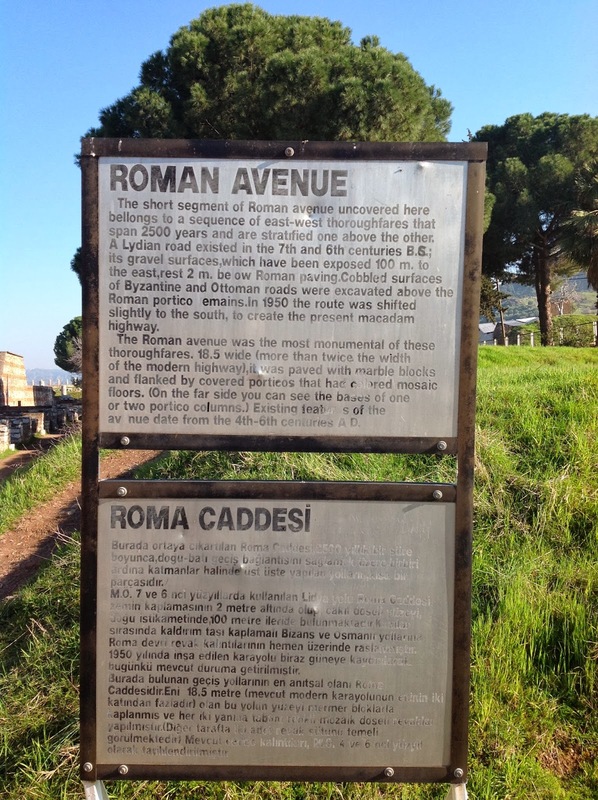 I've always been fascinated with the Roman world, but I think I've had my fill of them for awhile. When you see the grandeur of what they built, you can't help be in awe. But then when you consider how they were built -- with slaves working, well, like slaves -- it's very sobering. Imagine someone looking in a thousand years admiring the ruins of, say, Beijing or Pyongyang; the difference being that the Romans were much better builders than the communists of our time. 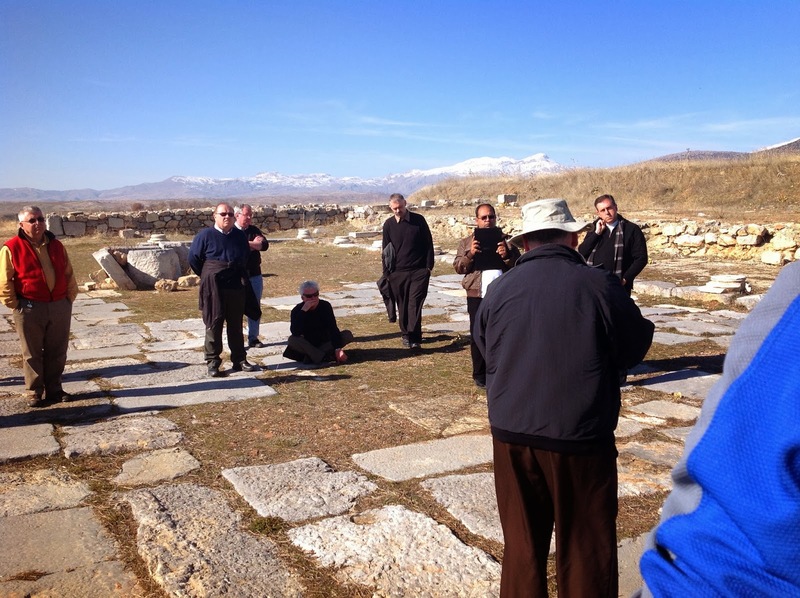 Listening to Acts 13, describing Saint Paul's sermon to Gentiles in Antioch of Pisidia. I didn't take any more interesting pictures! 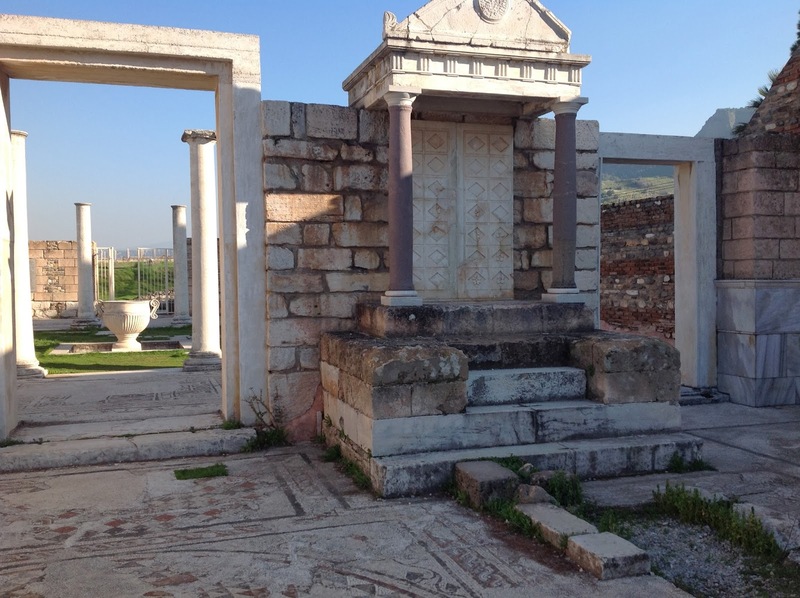 The gate of Sardis. This is one of the seven cities to which Saint John addressed admonitions in the Book of Revelation. Courtyard leading to the synogogue. Beyond it, you can see just the top of the remains of the gymnasium, partly reconstructed. This niche may have been the ark for the Torah Scrolls. One of the curious things about Hierapolis was the way the local water sources both wrecked the city and also created a natural wonder. The water is heavy in calcium, with the result that it leaves heavy deposits wherever it goes. 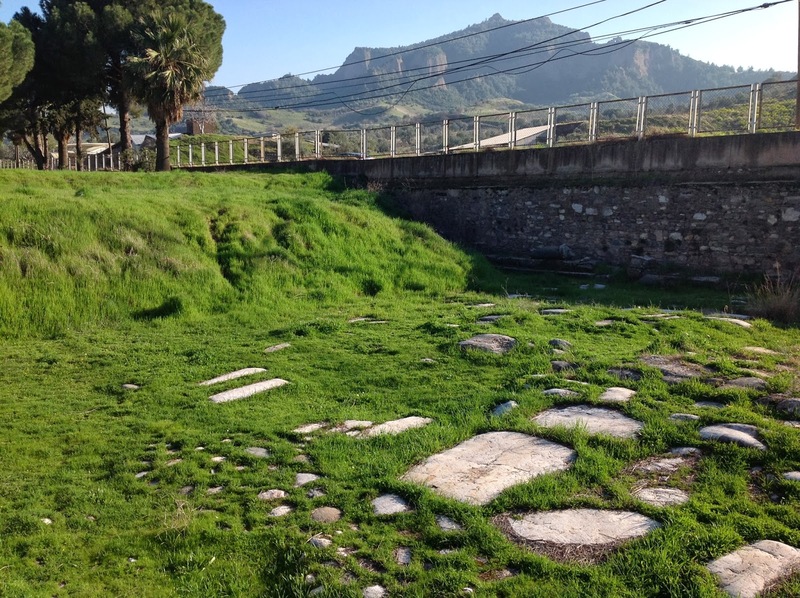 The ruins of the city were caked in heavy layers of the stuff, and you could see where the water -- that once fed massive fountains in the city -- had created new channels across the area in the centuries since. 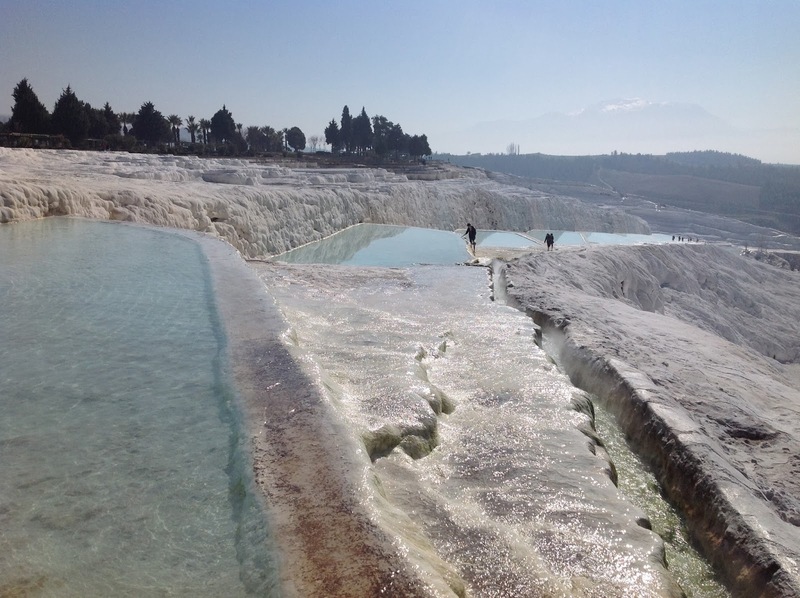 But the water also created a wonder: cliffs and terraces of brilliant white carbonate. Here are some pictures of this. This series of pools, fed by the hot springs, leads down to the bottom of the hill. The pools, however, are extremely slippery. 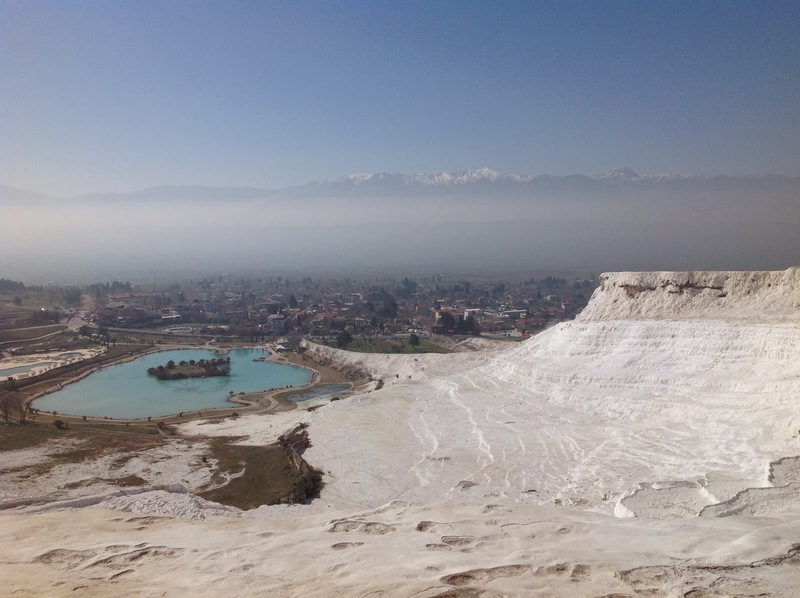 Another view of Pamukkale ("Cotton Castle" in Turkish). The stone formations are extremely painful to walk on in bare feet! Most of us paused to soak our feet in the hot springs that create this wonder; one chose to soak his head. To close out this post, I'll share this last image. If you look closely, you'll see one of our priests standing in the shadows to the right. That gives you perspective. Were these two pillars reconstructed? If so, it would have taken some serious equipment to do it, and it wouldn't have been easy to get it up onto the hill where this was. If they were reconstructed, why did someone go to the trouble of lining up the stones so exactly, yet not line up the two capitals (note the right one is lined up properly, while the left one is askew). That led us to think that these two were the only ones not knocked or pulled down. Why knocked or pulled down? Two reasons. First, it was a pagan temple. 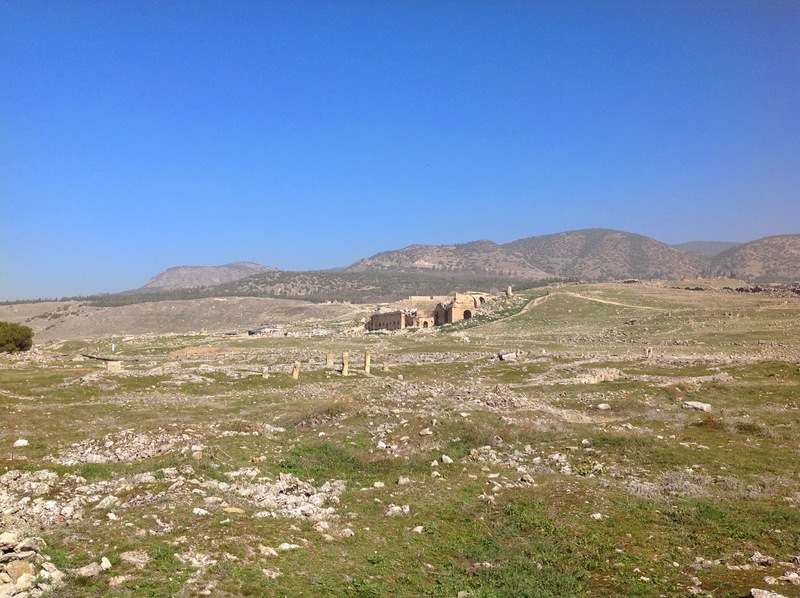 (The small, brown structure in back, on the right, is a Byzantine-era church.) Second, it was quite common to plunder the ancient sites for building material. That's why the Colosseum in Rome is no longer covered in marble. 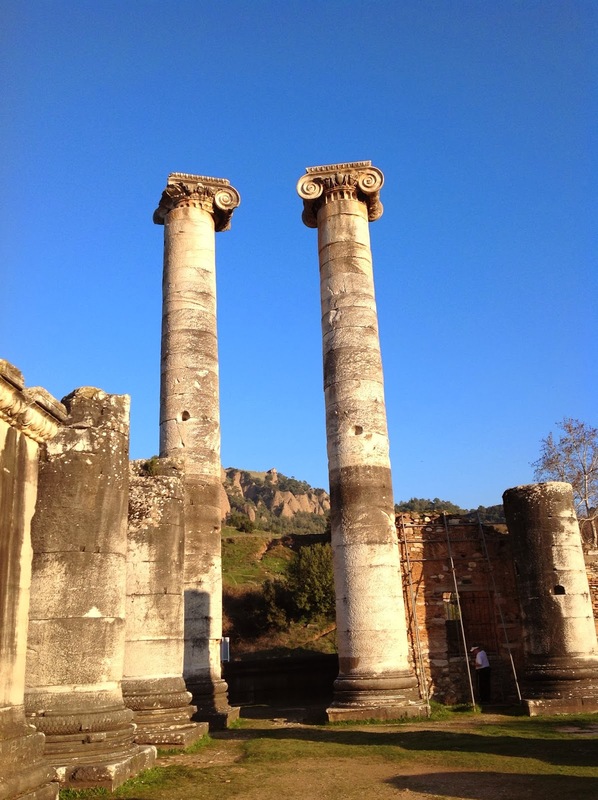 As we gazed up at these pillars, we wondered at how hard it would be simply to bring them down. I suppose with quite a lot of horses, maybe? The best leverage would involve having someone climb up those pillars to get a rope toward the top. But all these ages later, those seams between the blocks are remarkably tight. Not an easy climb. But one more puzzle before I close out this post. 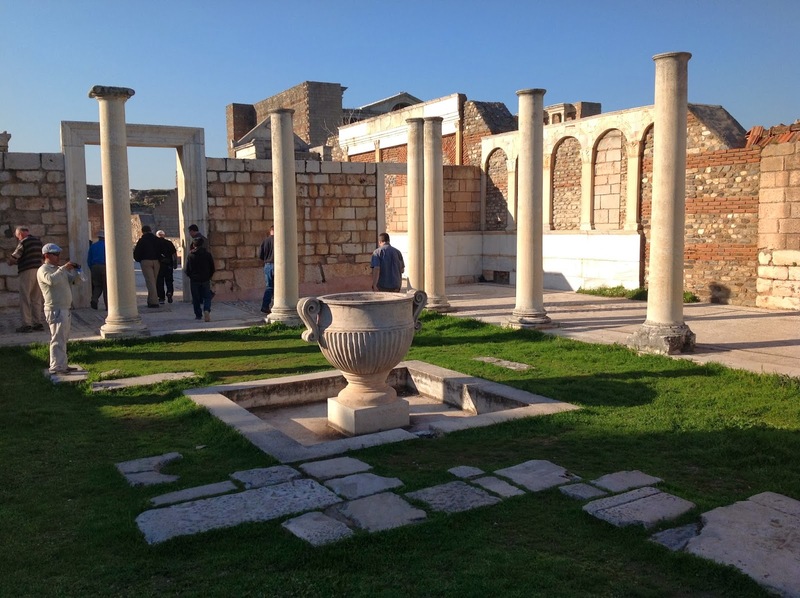 (My next post will describe our amazing experiences in Ephesus.) If those columns weren't reconstructed, but are still standing where they were built so long ago, then why is the one capital askew? Thank you for posting your photos and writing about your observations. I laughed out loud when I saw that hilarious photo of your traveling companion dunking his head in the water!